Gardening is inherently eco-friendly…or is it? There is a lot we can improve on in conventional gardening to make it more environmentally conscious. These 10 eco-upgrades to your home landscape will help you create an eco-friendly garden you (and your local wildlife) will love! Eco-friendly gardening is all about working with nature. Natural landscaping techniques imitate nature while also incorporating the best edible gardening practices to provide food for gardeners and for wildlife. The best eco-gardens are regenerative (self-sustaining), just as ecosystems in nature support themselves. Here’s 20 gifts under $20 perfect for eco-friendly gardeners! One of the best (and most delicious) ways to make your garden eco-friendly is to grow some of your own food. Where I live, much of our produce is trucked in from other countries for most of the year. 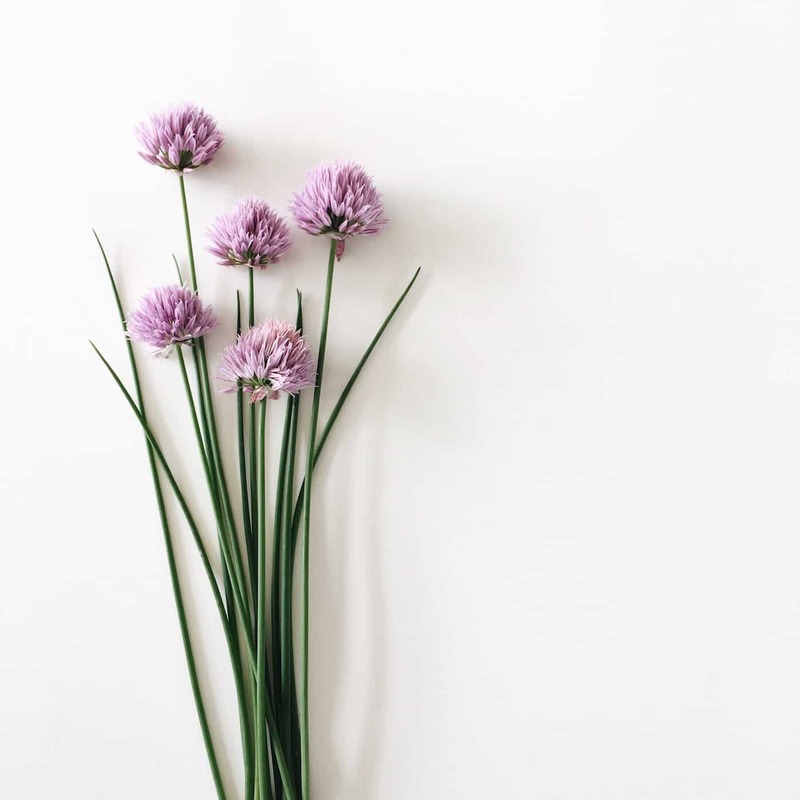 By growing some of your own veggies, herbs, and berries you’ll decrease your reliance on food delivery systems which include emissions from large-scale farming, storage/refrigeration, and transportation. You’ll also have less grass to mow if a portion of your lawn is garden! Greens like kale are easy to grow and can be sown successively (and even in the winter in some areas). Perennial berry plants like blueberry bushes and raspberry canes are also excellent producers for the home garden. Fruit trees like apples can handle cold winters and the fruit can be stored for months in a cellar. You can even buy fruit and nut trees online during the dormant winter season. Even garlic is quite easy to grow at home (and is much healthier and more flavourful than imported garlic). Garlic can be planted in the fall or early spring. The scent of garlic growing has the added benefit of organic pest control as many pest insects don’t like the smell. It’s a win-win for an eco-friendly garden! If you want your garden to be eco-friendly, it pretty much has to be organic. Organic gardening foregoes harmful chemicals like pesticides, herbicides, and fungicides in favour of working with nature to create a healthy garden eco-system. Just because your garden is organic doesn’t mean it will be a bother to switch though! You can read more about organic gardening here (including why it’s important). Stop using any chemical fertilizers in your garden (hint – if it’s a bright colour, it’s probably not organic). Also stop using any potting soil that contains chemical fertilizer or pesticides. Nitrogen and phosphorus pollution from chemical fertilizers used in both home landscapes and agriculture is now recognized as a major environmental issue. 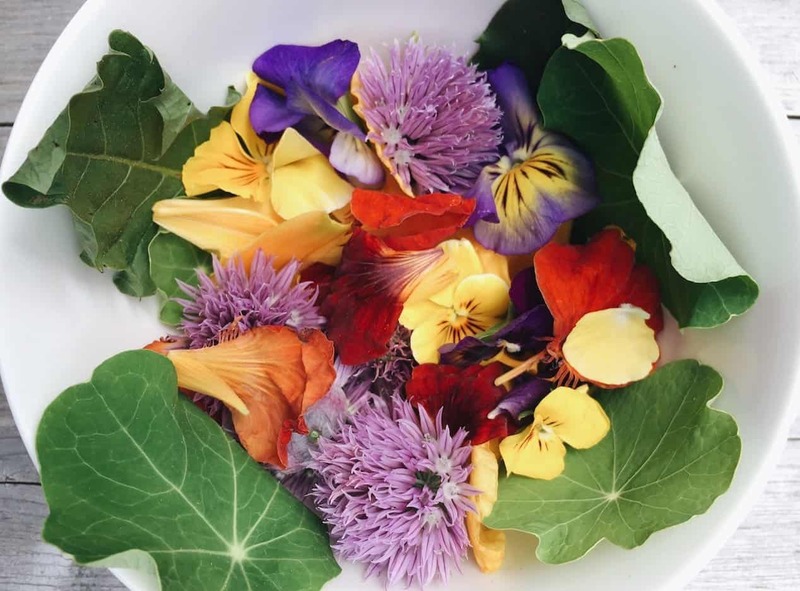 If you’re worried about other ways that non-organic gardening chemicals sneak into your garden, check out this article. An important part of eco-friendly gardening is to choose untreated, non-GMO seeds and plants. Fortunately many heirloom seed companies have taken The Safe Seed Pledge, which details their commitment to collecting and distributing sustainable seeds that can be used safely by future generations. Plants can be trickier to source. To find plants raised in an ecologically-friendly manner, chat with your local independent nursery staff or your garden mentor. Many local garden clubs and universities host annual plant sales which feature plants raised in organic gardens. You’ll be able to talk to the grower about how the plants were raised and ask them for tips! Best of all, your plant will come with it’s own unique story. No discussion of eco-friendly gardening is complete without mentioning permaculture. Permaculture is basically a unified grab bag of best practices for living sustainably. Many gardeners discover permaculture when they start to research companion planting or other organic gardening techniques. If you’ve never heard of it (or would like a little more info on what it is), check out this article which explains the concept of permaculture. If you’re the kind of gardener who likes to take derelict corners of city land and make them beautiful again, you’ll love the ideas that permaculture will open up for you. If you’re the kind of grower that likes to compare the carbon footprint of peat moss versus coconut coir in your garden, you’ll appreciate the data-based approach that many permaculture practitioners embrace. 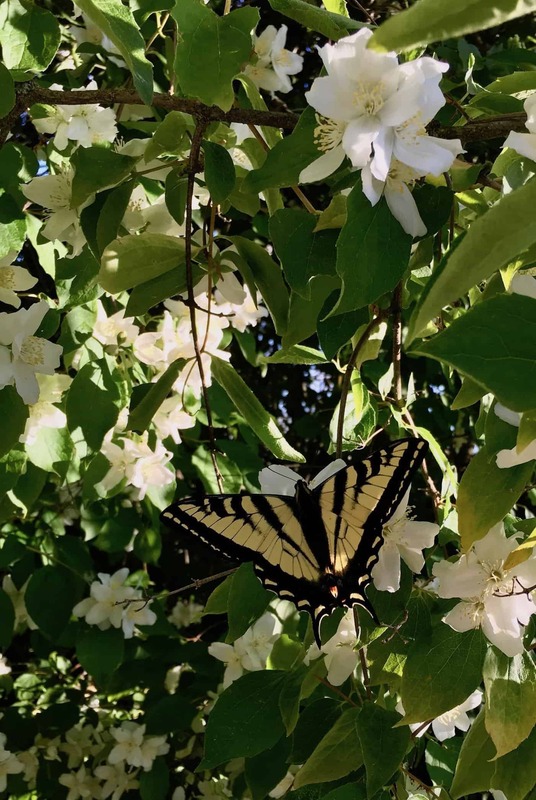 If you’ve planted deciduous shade trees that provide food for pollinators, keep your house cool in the summer, and let sunlight through in the winter, you’ll appreciate the function-stacking potential that permaculture unlocks. An introductory permaculture book like Gaia’s Garden is an excellent place to start. Also check out online forums such as permies.com. As you get more involved, you’ll likely consider taking your Permaculture Design Certification. I did mine a few years ago and loved it! It was such a worthwhile experience (and my garden is much more eco-friendly because of it). One of the most important aspects of an eco-friendly garden is to attract and support pollinators. Environmentally-concious gardeners can support pollinators by providing pesticide-free food sources, safe shelter, and access to clean water. Pollinators are attracted by flowering plants, although not all pollinators are attracted to the same plants. Having variety in your plants, including having plants with a variety of bloom times, will help attract and support pollinators. Pollinators will also be drawn to native plants. Consider planting a meadow portion of your lawn with wildflowers to act as a pollinator garden (you’ll save time and lawnmower gas). One of the most efficient pollinators is the mason bee. Mason bee nests are becoming more and more popular. These little bees have amazing pollinating abilities but require specific shelter sizes and construction mud. You can ensure your local bees set up shop in your yard by installing a mason bee house (or bug hotel for whichever local pollinators you’re trying to attract). Pollinators aren’t the only wildlife to attract to your garden. There are a host of beneficial birds and bugs that contribute to a healthy ecosystem. Seasoned organic gardeners love to attract and support pest predators and soil aerators to their gardens. Insect-eating birds can be very helpful in the garden to keep pest populations in check. These birds can be attracted to the garden early in the season (before insects become a problem) by providing suet for them to eat. This will show them that your yard is a good place to set up shop for the summer! They’ll also appreciate a source of fresh water in the hot summertime. These birds will reward you by eating slugs, grubs, caterpillars, snails, and mosquitos during the gardening season. Butterflies such as the monarch are an important model species for ecologists when determining the health of an eco-system. Many gardeners plant milkweed in their eco-friendly gardens to attract monarchs by providing a source of food for monarch caterpillars. Ladybugs are another wonderful beneficial bug for the garden. Ladybugs eat aphids and are a well-established form of organic aphid management. You can even buy ladybugs to take home to your garden. Worms are also highly desirable in an eco-friendly garden. Worms help to break down decaying plant matter and also to aerate the soil. Reducing waste in the garden by re-using supplies year after year will help keep your gardening environmentally friendly. Plant pots leftover after you buy plants can be re-used next year or donated to garden/horticultural/permaculture clubs (which often host plant sales and need lots of plant pots). You could even divide some of your perennials like peony, iris, and lily and give them out to friends in your leftover plant pots. Seed starting trays are another item that can be re-used from year to year (provided they’re properly cleaned). 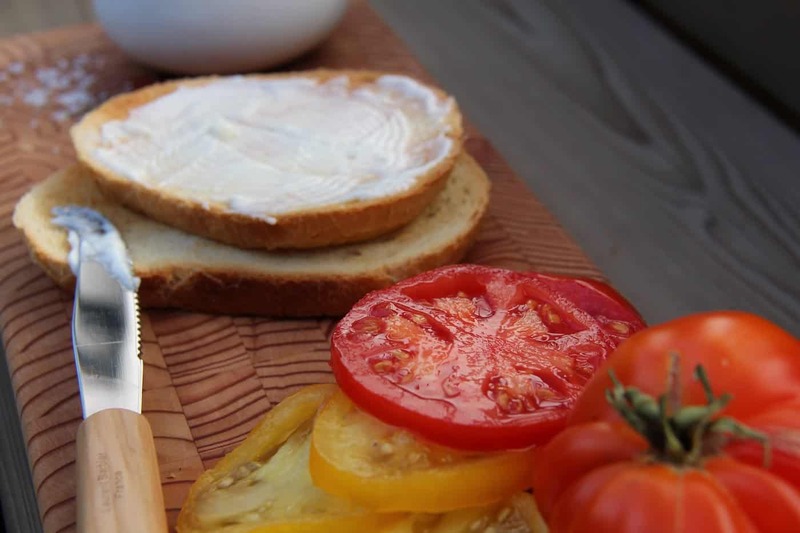 Most gardeners use the plastic seed starting trays, but many environmentally-concious growers are moving towards using the old-fashioned wooden trays. For starting finicky crops like squash, soil blockers are gaining popularity along with these little gadgets that turn newspaper into a seed starting pot. Glass and even plastic bottles can be re-used as cloches to protect small plants from frost. Here’s a neat article about glass cloches, including why they’re used and how to make them yourself from old glass bottles. There’s a ton of way to re-use items in your eco-friendly garden! Water conservation is a key part of an eco-friendly garden. Many gardeners choose to install rain barrels or swales so that they can direct rainwater to their gardens. Others have installed grey water systems or simply use dish rinse water to irrigate their gardens. Tap water can be used on gardens if rainwater isn’t available, but it is often chlorinated. The chlorine can negatively affect soil and plant life in an otherwise eco-friendly garden. You can decrease the amount of chlorine in tap water for your garden by filling a watering can with tap water and allowing it to sit and off-gas overnight. When tap water is used in a hose, choose a water-wise method of irrigation such as installing your own DIY drip irrigation. 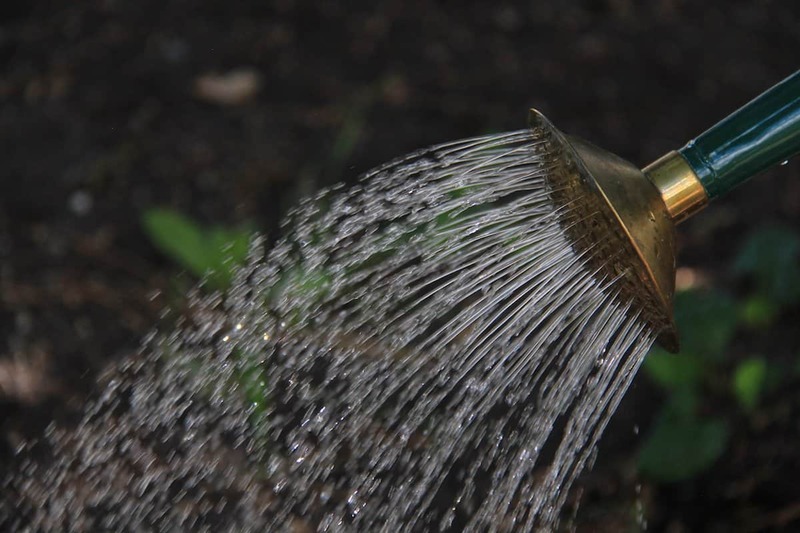 Speaking of hoses, many gardeners choose to install a drinking water safe hose for hand watering plants close to the house (particularly container plants and raised beds). If you’ve ever had a drink out of a warm conventional hose in the hot summertime, you’ll know that the water tastes like chemicals! Drinking water safe hoses, or RV hoses, are a better option that’s widely available. The clear hose pictured above is available online from Amazon. 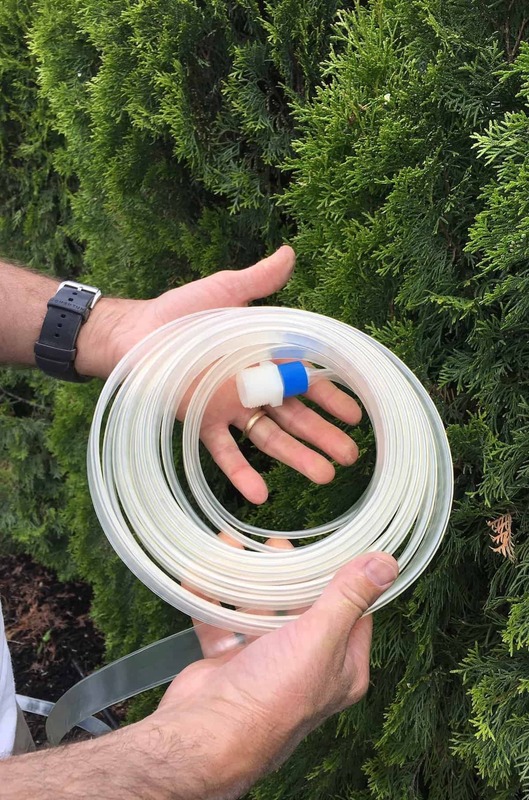 A more rugged garden-style hose is available online from EarthEasy. For natural eco-friendly garden landscapes, choose water-wise plant varieties native to your region or growing zone. 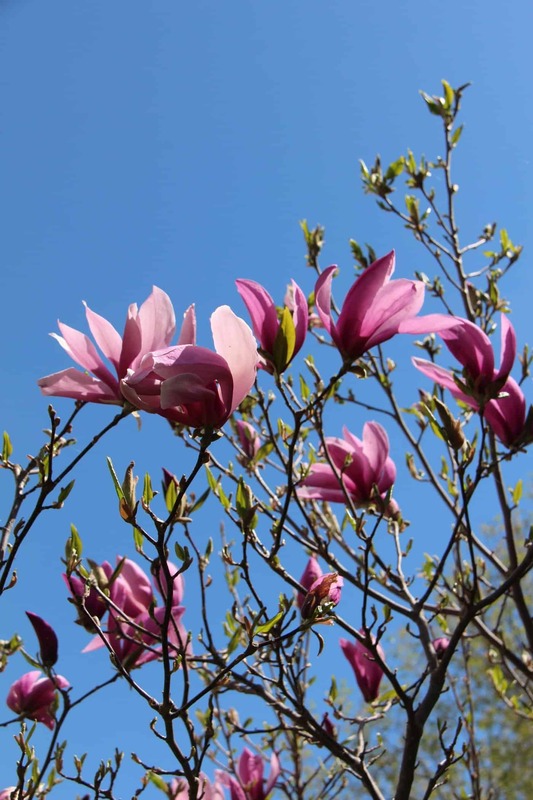 These plants have adapted to the natural amount of rainfall and are more likely to thrive with minimal irrigation. A nice layer of organic mulch such as compost will help to lock in moisture and keep the plants happy through the heat of summer. If possible, choose untreated natural local building materials for garden structures such as fences, decks, built-in furniture, and raised beds. In our area we are lucky to have a number of excellent sawmills which sell sustainably harvested lumber. Do some local research to find out which renewable building materials are available in your area. When using wood, many gardeners choose to use sustainably-harvested unfinished cedar for outdoor applications due to it’s resistance to rot. We recently replaced our cedar deck as it was just starting to deteriorate…25 years after installation! Cedar does last a long time. Other woods likely won’t last as long, but that doesn’t completely put them out of the running. Other woods that are more prone to decay can be used in hugelkultur once their structural lifespan is over (as long as the lumber hasn’t been treated with chemicals). When choosing wood for your eco-friendly garden, stay away from pressure-treated wood. Pressure-treated wood is injected with chemicals which act as fungicides (and sometimes insecticides). While this is desirable in some applications (like utility poles) it’s best not to use this wood in your garden. You want to promote beneficial fungi and insects in your garden as they are a helpful part of the soil food web. The only treatment I use on the natural wood in our garden is a non-toxic, VOC-free Eco Wood Treatment. 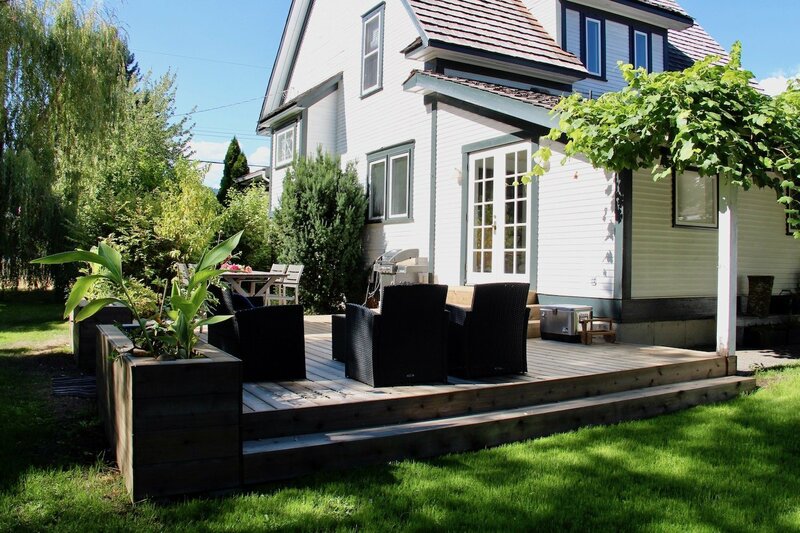 It gives the wood a consistent silvery aged colour (see our deck project for before+after photos). This treatment is a Canadian-made product that is free from harmful solvents and other chemicals. It’s been used in parks and other municipal settings where harmful chemicals are prohibited. 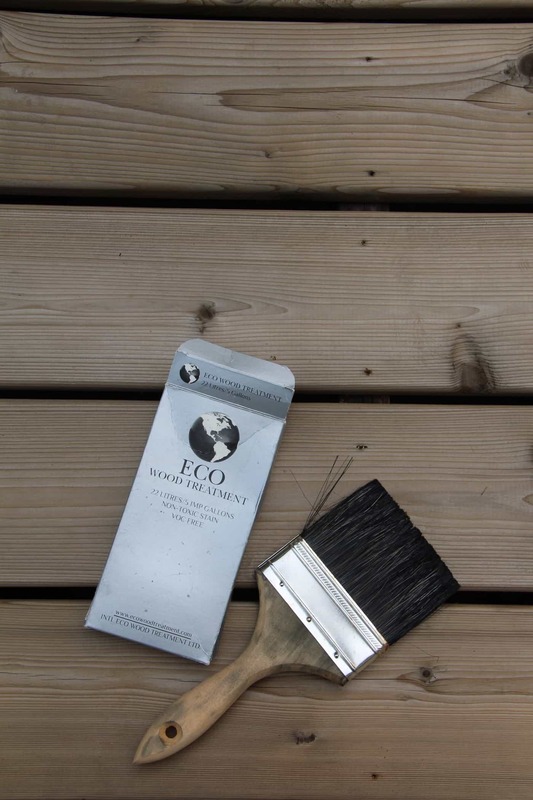 Find this Eco Wood Treatment on Amazon, from sustainable living retailer EarthEasy, or in Canada at Home Depot. If wood is not plentiful in your area, recycled options such as Trex composite decking are also available. Although more expensive, they have quite long lifespan. Composite decking and furniture retains heat more readily than wood, which may be a good thing or a bad thing depending on the application. Composite furniture is often fastened with aluminum fastenings. Aluminum is excellent for outdoor applications as it doesn’t rust like steel. Aluminum is also fully recyclable so it can be re-used once the furniture’s useful lifespan is completed. Note that aluminum recycling takes only 5% of the energy used to mine new aluminum, and it can be recycled over and over again (source). Almost 1/3 of the aluminum produced in the US now comes from recycled scrap! Choose aluminum if you can for your outdoor fastenings. When considering your deck and other outdoor living areas, it’s also prudent to consider your lighting. Solar-powered lighting is common in outdoor areas as a way to reduce grid electricity use (and also to forgo having to run wiring outdoors). Lights are often pointed down at the ground to reduce light pollution. Conventional lighting can be controlled by installing an automatic timer to limit duration. 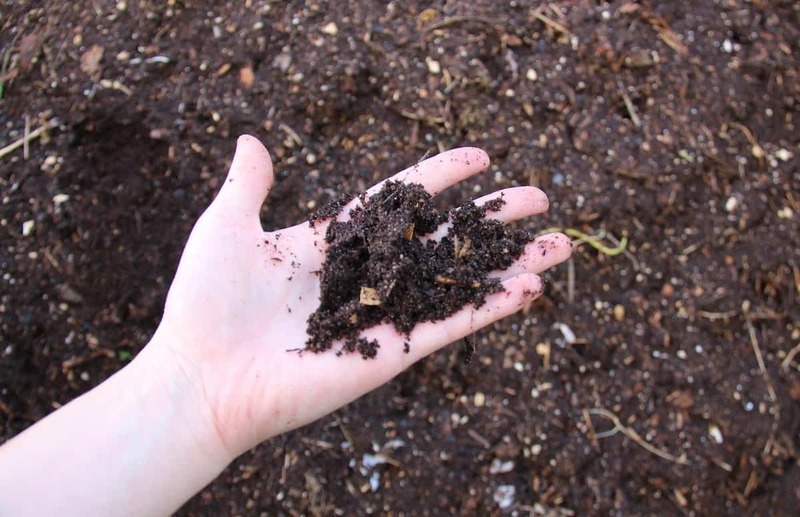 Making your own homemade compost is a great way to turn yard waste into nutrient-filled compost for your garden. By composting yard waste, you’ll keep your excess organic matter on site and put it to good use. One of the easiest ways to compost is to make leaf compost in the fall for use during the next gardening season (see tutorial here). If you’re short on space, vermicompost (worm composting) is a great alternative. Indoor worm composting has become more common lately, with some gardeners making their own DIY worm composters and others choosing a worm composting kit. Homemade compost and vermicompost both can be used to make compost tea. Compost tea is a wonderful soil enhancer that is an eco-friendly alternative to chemical fertilizers. See these instructions for making your own DIY compost tea at home. 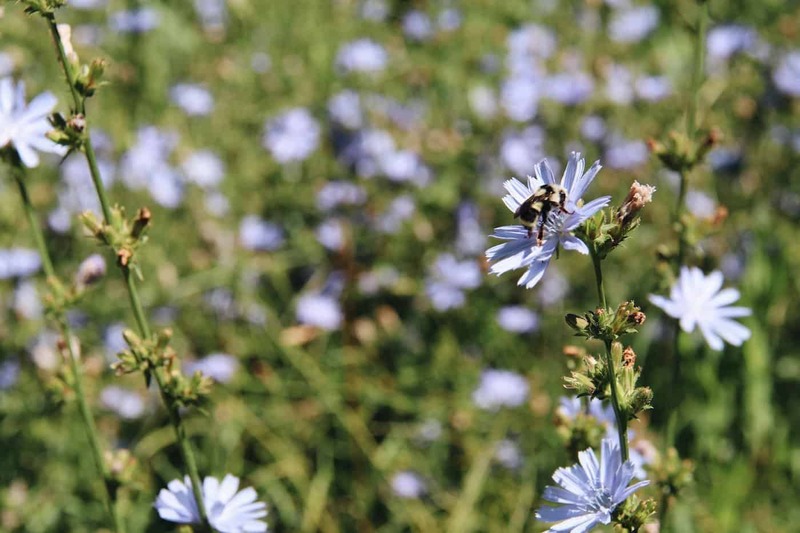 Creating your own eco-friendly garden will not only give you access to plentiful organic food, but it will also help support pollinators and other beneficial insects and wildlife. You’ll be taking care of our environment by avoiding pollutants such as phosphorus-rich chemical fertilizer and even less talked-about pollutants like light pollution. Saving these ideas for later? Pin this article! What eco-friendly gardening techniques do you use? Are you switching your garden to organic? Share your stories and questions in the comments section below!